Hedgehog and moon double brooch, catch a falling star A double brooch featuring a little hedgehog holding a net trying to catch falling stars which tumble down from a crescent moon. I created the hedgehog by crocheting coloured and silver filled wire and gave her a tiny black onyx stone eye and a tiny sterling silver bead nose. she holds a net to catch the stars in which I made by crocheting and wrapping silver filled wire over a strong wire base. The moon brooch is crochet silver coloured copper wire and dangling from the moon is a string of three tiny howlite stone stars on a sterling silver chain which is attached at the other end to the hedgehogs net. The double brooch has three brooch pins on the back, one ordinary brooch pin on the back of the hedgehog and 2 tie tac style brooch pins one on the back of the net and one on the back of the moon. 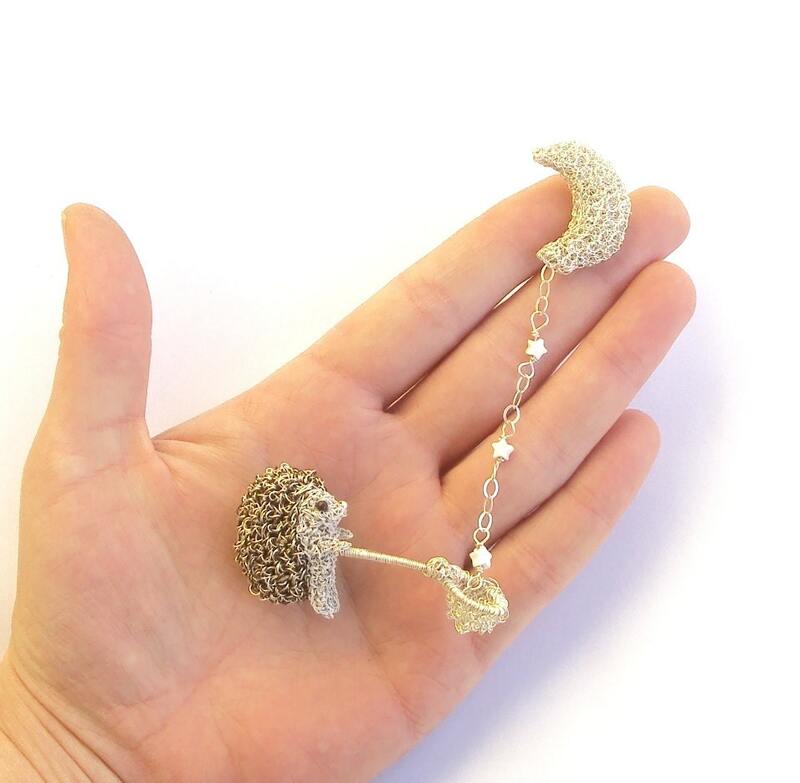 The hedgehog holding her net measures 3cm (1.2 in) tall and 5.5cm (2.2 in) long, the moon measures 3cm (1.2 in) tall and 2cm (0.8 in) wide and the chain of howlite stars connecting the brooches together measures 6.5cm (2.6 in) long.